My bedroom doubles as my craft room and it is one cramped little mess! I have craft supplies stashed everywhere like a crafty squirrel. I am slowly but surely getting organized, and I'm starting with my sewing area. While cleaning out my closet I found a styrofoam block from some old packaging, and a lightbulb came on over my head. I had originally intended to just poke a few dowels thought the block and use it for ribbon storage, but like most craft projects, it evolved from there. 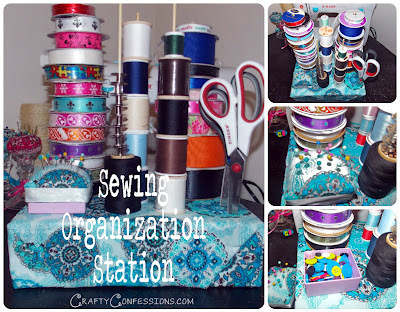 This organization station is the perfect little addition to my sewing area and today I am going to show you how to make your own. Poke your dowels/skewers into the foam where you want them. 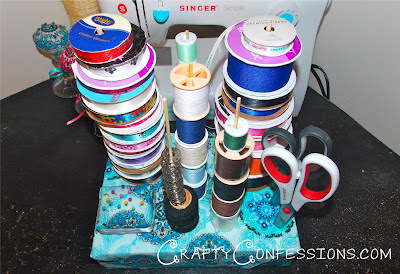 If you are storing ribbon make sure to space them far enough apart that the spools don't touch. You can space much closer for thread spools. Push your scissors into the foam where you would like them to go. It is important to have all of your holes in place before you cover your block with fabric. If you are forgetful like me it may be helpful to take a picture of your block. Remove the skewers and scissors. Cover the block with fabric and secure to the bottom of the block with hot glue or staples. I did both. Because it is foam the staples may slide out over time. Once you have covered your block feel around the surface for the holes. Use your Exacto knife to make a slit in the fabric to place your dowel through. Carefully hot glue the insides of the holes and press the dowels in before the glue dries. To make the pincushion button/needle box use this easy tutorial. Once the box is done hot glue it in place. Fill the station with your supplies and enjoy your new sewing organization station. I used contrasting fabric to my sewing box to keep with the theme of my sewing area. Before this little project I just had all of my sewing supplied stashed into my sewing box. It was a disaster. Thread was tangled, buttons were mixed up with everything, and I could never find my fabric scissors. Now I have everything I need right next to my sewing machine. Clever idea! I hate mess so this is right up my street. I LOVE this!! I'm working on my craft room right now and this is perfect. Thanks for the awesome idea! Fabulous project! Thanks so much for sharing this great idea. What a great idea! Would love for you to share this at my link party. Hope to see you there!